You may not see them, but they’re there. 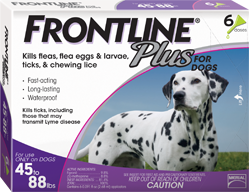 That’s why you need protection like FRONTLINE Plus that can attack fleas and ticks on your pet. Anything less just won’t do. Stop by Bar None Country Store for all your pet supplies for controlling fleas and ticks.